Dr. Alexina Mehta encountered yoga and the spiritual traditions at a young age and is fascinated with the possibilities of human potential. Her great grandfather, R.B. Lal Singh Mehta was on a team who discovered the oldest written book ever found of earth so far, called the Diamond Sutras. The book teaches about enlightenment and compassion. These teachings are an important part of Dr. Mehta’s life. 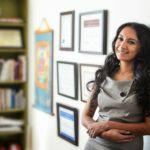 Her undergraduate education in Kinesiology and Fitness at the University of British Columbia gave her the initial tools to discover how the body works on a mechanical and physiological level, while her formal training in Yoga and Pilates awoke in her the knowledge of the other levels at which the body works. She went on to study Naturopathic Medicine and now is passionate about guiding people to higher levels of well-being. Alexina has also trained in other healing modalities such as Craniosacral Therapy and Bowen Therapy, Energy healing, Intuition Development, Family Constellation work, Nia dance, as a Doula, Reiki and Dying Consciously work. She also is a graduate of the Four Winds Energy Medicine Institute. As part of her training, she journeyed to Peru to be with the Qu’ero elders, the indigenous peoples of Peru. Alexina’s curiosity started at an early age, where she began learning about the body, the mind and beyond. She loves working with people being at the forefront of what is possible, and allowing for such possibilities to become realities. Currently, Alexina practices Naturopathic Medicine in Vancouver, BC, utilizing the modalities of herbal medicine, lifestyle counselling, homeopathy, physical medicine, nutrition, acupuncture, energy medicine and more.